Usually in astronomy we study objects by the amount of light they emit. Most regular matter gives of light in some form or another. 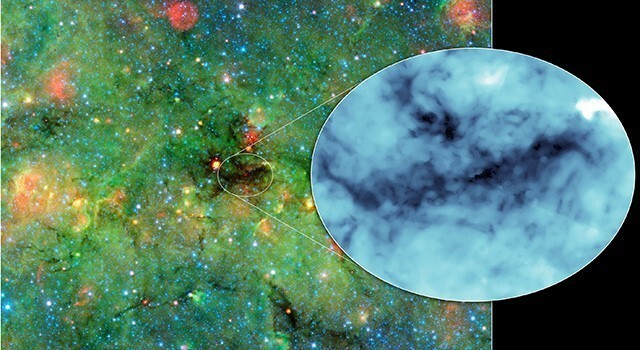 Even the cold interstellar medium will emit some light at infrared or radio wavelengths. But one downside of this is that the light generally comes from the surface regions of an object. To study the interior of an object we generally have to use aspects of emitted light from the surface to determine properties of the interior. For bright objects like stars this works pretty well, but for dim objects like dark interstellar clouds this is more of a challenge. 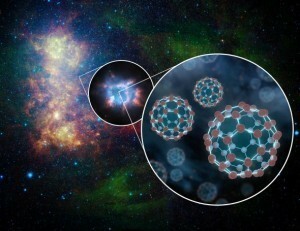 Recently a team with the Spitzer space telescope has used a different method. Spitzer is a sensitive infrared telescope, and the team has been using it to observe cold, dense interstellar clouds by the infrared light that passes through them. There is a great deal of infrared light in the universe, and when that ambient background light passes through a dark cloud we can determine things like its density and composition from the light they absorb. Basically it is a way to study dark clouds by the shadows they cast. Some of the team’s results were recently published in the Astrophysical Journal Letters. One of the things they’ve announced is the darkest and densest interstellar cloud ever discovered. It has a mass of about 70,000 Suns, and is only 50 light years across. This cloud is probably in the earliest stages of collapsing into a cluster of large and bright stars (O-type stars). Gaining a better understanding of dense clouds like this one will help us understand just how such large stars form.